On 14 December, nearly two years after the launch of accession negotiations with the EU, Serbia opened the first two chapters, on financial control, and the normalization of relations with Kosovo. EURACTIV Serbia reports. Serbia has thereby reached a higher level of partnership with the EU, whereas the Union has confirmed that, despite “enlargement fatigue” and serious internal and external security crises it faces, it is not abandoning its enlargement policy. The opening of chapters was primarily enabled by the progress Belgrade had made in the normalization of relations with Pristina, with which it reached four new agreements in August. Serbia has also proven to be a reliable partner for the EU in helping manage the refugee crisis. For Belgrade, the opening of Chapter 32 on financial control and 35 on the normalization of relations with Kosovo is a historic step, and recognition of the efforts it has made undetaking reforms and normalizing relations with Kosovo. “We no longer have to dream about the EU, we now just have to do the hard work, but if we are industrious, we’ll be part of the big family of European nations,” said Serbian Prime Minister Aleksandar Vu?i? on 14 December, in Brussels, adding that the opening of the first chapters was also important as affirmation of what type of society Serbia wanted to be. According to Eurosceptic politicians, such as Serbian President Tomislav Nikoli?, Serbia earned that privilege a long time ago by meeting very difficult conditions. What it will be asked in Chapter 35 will show whether the EU truly wants it among its ranks, given that Belgrade does not plan to recognise Kosovo’s independence. From the EU’s perspective, the opening of chapters is a crucial step for Serbia, but it has much to do on that path. “The road is long and difficult, but Europe will be with you,” said Luxembourgian Foreign Minister Jean Asselborn after the EU-Serbia Intergovernmental Conference in Brussels, at which the first two chapters were opened. Serbia expects to wrap up the membership talks in four to four and a half years, and be ready for full membership after 2020. EU Enlargement Commissioner Johannes Hahn said Serbia had set a very ambitious goal for itself, of completing the negotiations as soon as possible, and added that the EU would do everything to support it in the endeavor, but that Serbia, as a candidate, must go down the established path. There is no speed limit or any other particular limit, but rather a certain distance a candidate country must go. The pace at which they will do so is up to the candidate, and “we cannot shorten that distance”, Hahn told a press conference after the Intergovernmental Conference. Although EU membership is a fairly distant objective, the support of the Serbian population is more or less stable, and is just above 50%. According to an opinion poll conducted by TNS Medium Gallup, the results of which were unveiled on 2 December, in a potential referendum on EU accession, 56% of Serbian citizens would vote for the membership, while 26% would vote against. However, 46% of those polled believe that the recognition of Kosovo’s independence is the main condition Serbia has to meet in order to join the EU, whereas 64% are against the recognition for the sake of membership of the Union. The Belgrade-Pristina dialog and the normalization of relations are supported by around 60% of the polled. Will Serbia Have to Recognize Kosovo? The opening of Chapter 35 has reignited a debate among the Serbian public about whether Serbia will at the end of the process be asked to recognize the independence of Kosovo so as to become an EU member, given that the EU negotiation position for that chapter envisages the making of a legally binding agreement. The Serbian prime minister and other top state officials have underscored that Serbia is not being asked to recognize Kosovo, but rather to further normalize its relations with Pristina. “Someone has to tell us what that document means, because no one is saying it’s recognition. We always see things in the worst light, but it’s not written that way anywhere. It was written in the drafts, but it’s not in these papers now,” Vu?i? told B92 TV, in response to the question of whether Serbia would sign the legally binding agreement on Belgrade-Pristina relations proposed by Germany. In the EU negotiating framework, the objective for Chapter 35 is defined as comprehensive normalization of relations between Serbia and Kosovo “in the form of a legally binding agreement (…) with the outlook of both sides being capable of fully exercising their rights and fulfilling their obligations”. Foreign Minister Ivica Da?i? pointed out he did not expect any “traps” in Chapter 35 on Kosovo and that the chapter was not a replacement for the ongoing Belgrade-Pristina dialog in Brussels. Chapter 35, in any case, will carry great weight in the membership talks, because the absence of progress in that chapter could block the other chapters. The mechanism for that is that the European Commission will recommend the suspension of the opening and closing of chapters until the balance is restored. It can do so at its own initiative, or at the demand of one third of member states, meaning that it would be enough for 10 countries to request it. The EU’s common position for Chapter 35 foresees regular progress checkups at least two times per year, and potential changes to the conditions, so-called “interim benchmarks,” in accordance with the results of the dialog with Pristina. The current benchmarks stated in the document are the implementation of the Brussels Agreement from April 2013 and the plan of implementation, i.e. agreements on energy and telecommunications, work on the implementation of technical agreements from the period March 2011 – February 2012, and further agreements and progress in the normalization of relations with Kosovo. Further progress is not clearly defined, but is determined as a “comprehensive normalization of relations between Serbia and Kosovo,” which will enable “both sides” to continue their European path and fulfill their obligations. Where foreign policy is concerned, Serbia, as Vu?i? pointed out on 14 December in Brussels, is wholly in favor of joining European Union ranks, but also wants to maintain its traditional friendship with Russia. Vu?i? explained that sometime after 2017, Serbia will nonetheless have to harmonize its foreign policy with that of the EU, including the matter of sanctions the EU has imposed on Moscow. “We wish to maintain our traditional friendship with Russia, which I think is in no way a bad thing. But we have to see how we will harmonize that with the European Union, perhaps not in 2016, or in 2017, but after that we will have to do it,” the Serbian prime minister explained at the press conference after the EU-Serbia Intergovernmental Conference. The membership negotiations between Serbia and the EU were officially opened on 21 January, 2014. The negotiating procedure for Serbia is most similar to the one being applied to Montenegro, i.e. the rule is applied that Chapters 23 and 24, on judiciary, security and human rights are among the first to be opened and among the last to be closed, and that any possible standstill in these two chapters may affect the entire course of the talks. Serbia has another special element, Chapter 35 which is titled Other Issues and for Serbia. It will be the chapter in which the normalization of relations with Pristina and the implementation of agreements are monitored. This chapter will be particularly important for Serbia, level with Chapters 23 and 24. 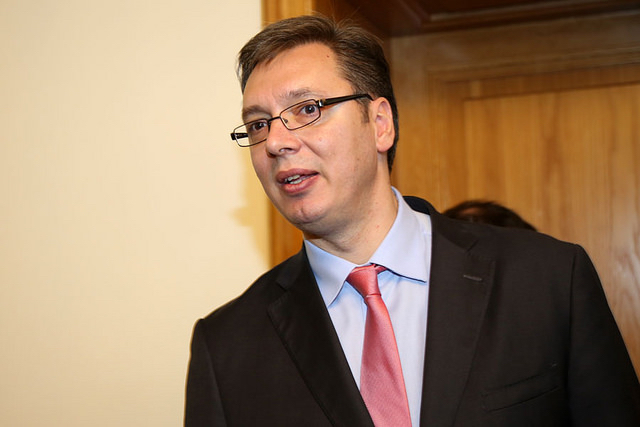 The opening of Chapters 23 and 24 in the negotiations with Serbia is expected to take place in the first half of 2016.